A RADICAL VOICE: 23 Women, an exhibit at the Southampton Arts Center, delivers a high-quality body of work which is delightfully varied, engaging, and thoughtful. However, the label ‘radical’, in the sense of being an abrupt break or extreme rupture or disruption, seems out of place. Instead, the work exemplifies the achievements of sustained studio practice over time. The exhibit is collectively comprised of artists who happen to be women. Many exhibit nationally and internationally. 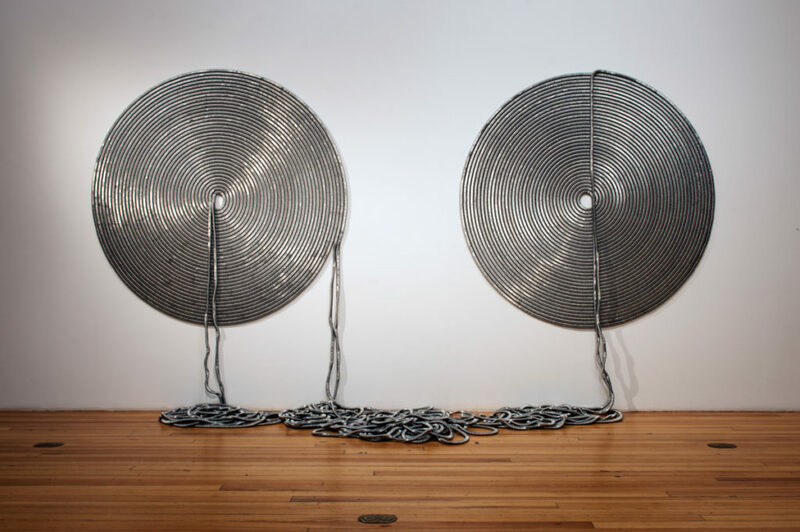 What connects the work for this particular exhibit is a curatorial vision which draws attention to the form and language of the artists’ materials. 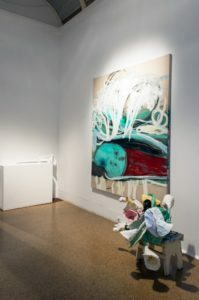 Gender or gender issues are subsumed under investigations of artistic personal vision and materials exploration, the trajectory of which may also intersect with matters of social, political and environmental concern. Olive Ayhens, Amanda Church, Martha Clippinger, Connie Fox, Regina Gilligan, Tamara Gonzales, Jacqueline Gourevitch, Lisa Hein, Priscilla Heine, Hilary Helfant, Elana Herzog, Alice Hope, Laurie Lambrecht, Judith Linhares, Erika Ranee, Judy Richardson, Bonnie Rychlak, Toni Ross, Drew Shiflett, Jeanne Silverthorne, Zina Saro-Wiwa, Jude Tallichet, and Almond Zigmund. The artist and pieces discussed below were selected as a means to intrigue readers and encourage those who might be inclined to see the exhibit, but haven’t yet, to get up and get going before the show comes down! “Justified” emerges from Toni Ross’s cross-over lexicon of minimalism and conceptual art. For the casual viewer, it is easy to gloss over. Common hooks to engage viewers’ attention such as loud flashy colors, monumental scale, dramatic angles, or even recognizable imagery are all absent. 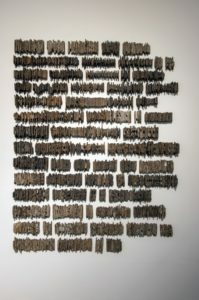 Instead, we are left with order, an appearance or illusion of repetition, and monochromatic variations of broken and assembled flat pieces of clay. The work falls within her current series of “Strata’ but the fragment pieces have become smaller, the arrangement more complex. 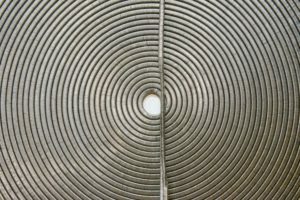 She retains signature gestures such as including small square or rectangular “holes” in the work and allowing the process to be evident in the work. This piece may raise more questions than answer them. As an ensemble grouping, the piece remains enigmatic. There are suggestions of a page layout, undeciphered text blocks that remain incomplete. Is Ross’s work a pointer or signifier to language and languages role in sustaining order or perpetuating oppression? 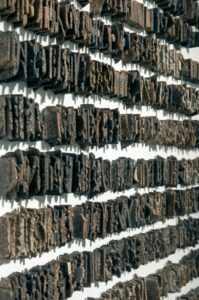 Or, since the is comprised of clay materials which runs deep in human history, is this work referring to the longevity of language and the power of the written word? The title has historical and political overtones which suggest other interpretations as well. To see more of her work visit: https://www.tonirossstudio.com. Artistic vision and materials matter in A RADICAL VOICE. We are reminded of the uniqueness of individual’s perspectives through the diversity of work. More importantly, viewers are invited to participate in their own interpretation of each piece. 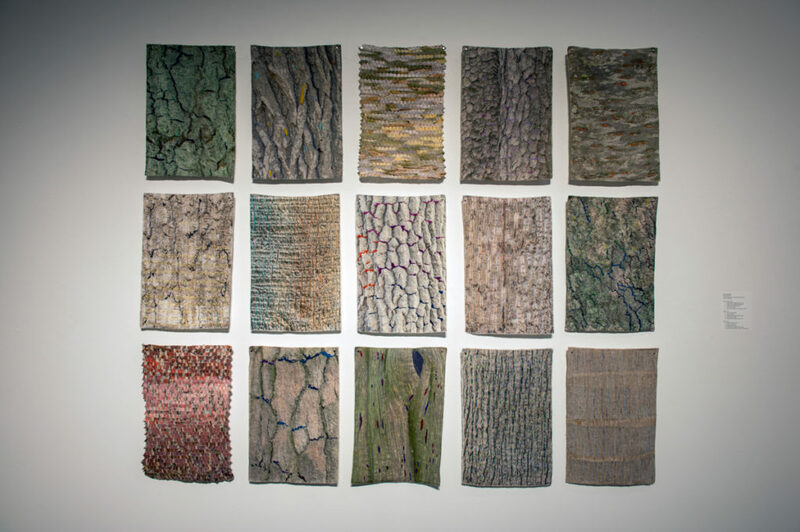 In this sense, the exhibit honors participant-viewers in constructing meaning, narratives or simply pre-conscious, felt experiences that the pieces evoke through form, shape, colors, textures, and materials. It is a subtle reminder that somehow visual art remains beyond the reach of words. About the Author: Andrew Buck earned his doctoral degree from Columbia University in art and art education. He is a free-lance arts writer and creative type who values goodwill, learning, and dialogue. For more info visit: https://www.andrew-buck.net or https://www.andrewbuck.nyc.